Our offices are closed April 19th for the holiday. Orders placed online will be processed on Monday when we return. The engine is assembled with the front cover, oil pan, valve cover, and turbocharger installed. 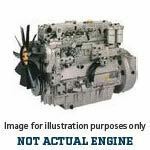 This remanufactured Perkins engine comes with a 12-month warranty. As always, your satisfaction is guaranteed! Caterpillar® and all of the Caterpillar® engine models listed on this website are registered trademarks of Caterpillar, Inc. Cummins® and all of the Cummins® engine models listed on this website are registered trademarks of Cummins. Detroit Diesel® and all of the Detroit Diesel® engine models listed on this website are registered trademarks of Daimler AG. John Deere® and all of the John Deere® engine models listed on this website are registered trademarks of John Deere. Diesel Parts Direct is not an authorized dealer for Caterpillar, Cummins, or Detroit Diesel. None of the parts beginning with "DS" or "R" are genuine Detroit Diesel, Cummins, John Deere or Caterpillar items.